How do you respond to conflict situations? Do you seek to avoid disagreements and conflicts? Perhaps you try to accommodate other people’s opinions to maintain the peace or you may always seek compromise solutions. You could also choose confrontation or resistance. Maybe you seek to manage conflicts by trying to find a collaborative solution. 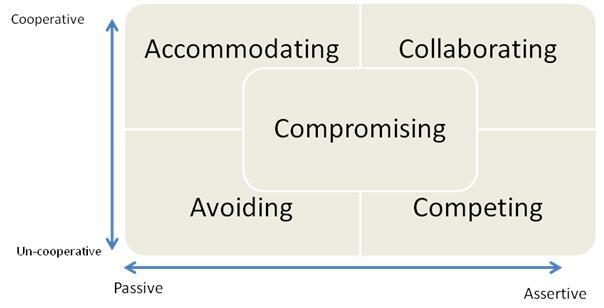 None of these modes of conflict are wrong in themselves but if you find that you are consistently favouring one over the others you are probably having poor conflict experiences. Each of these conflict styles are appropriate to particular situations and should be used accordingly. Thomas and Kilmann developed a useful analysis of conflict modes based on dimensions of cooperativeness and assertiveness. In a conflict we will be more or less cooperative in how we work to seek resolution of the conflict and how much we are seeking to maintain or develop relationship. We will also be more or less assertive of our position or needs in relation to the other person. Most of us tend to choose one or two predominant conflict modes. This may be okay but you are probably not getting the best out of conflicts and may be escalating unnecessarily or giving in and avoiding conflict too much. If you are aware of your preferred mode you can choose to use it or choose to use another as the case may suit. So if an issue is of little importance to you or you need to buy time it is appropriate to avoid the conflict. Or, if you need to gain resolution quickly within a limited time frame it may be best to compromise. Many people see collaborating as the best and ideal way of approaching conflict. This mode requires high cooperation and high assertiveness. It tends to produce better quality and longer lasting resolutions and is appropriate for teams or relationships with a high commitment to working productively together. On the other hand it can be very time consuming and is not really the best mode when the issue is where to go for lunch. Whatever mode you do use you can be more in charge of your choices. Conflict coaching can help you to be more aware of your current mode and to help you develop the awareness and skills to use other modes more productively and effectively. The conflict coach will help you to gain awareness of your current patterns and to develop strategies to change the ways in which you deal with conflict.